I hope you weren't thinking you'd seen the last of the watermelons now that the Release week is over.... I'm having way too much fun to stop! 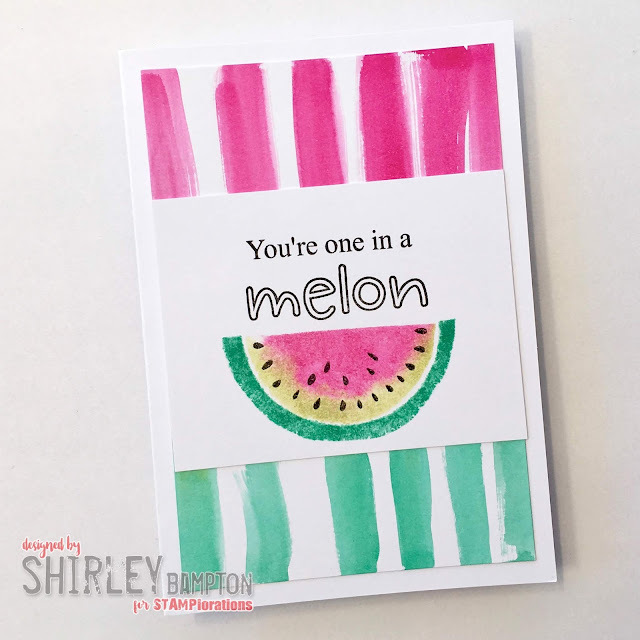 We've got some fab inspiration for you over at STAMPlorations, and for the summer, we've got a little incentive for you: every Tuesday through to September all stamps, stencils and dies will be 15% off (no coupon needed) - and if you use my code STAMPGIRLSHIRLEY you'll get an extra 20% off. Pop on over to the STAMPlorations blog, and don't forget to leave a comment for your chance to win a gift certificate tot he store. Sweet card. Love the stripes.